(Cambridge) Lunar Labyrinth was truly a collaborative performance, a meeting of varied art forms. 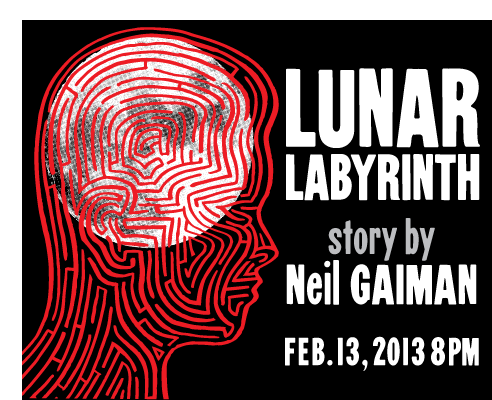 A theatrical adaptation of a chilling story which Neil Gaiman specifically wrote for Liars & Believers, this production made for a night filled with nontraditional staged performance buoyed by the aide of formatted storytelling styles and brave performers. Club Oberon plays host to groups who choose, as LAB did, to do theatre in the club, in which a performance can seem to be as revelational for the performer as for the audience. Mainly, a member of the audience is often “on stage,” sometimes to be used as a prop, sometimes an actor in the show and sometimes just to act as one who watches. In these kinds of settings, an audience unwilling to participate can be devastating to momentum. The audience was definitely live and attentive, taking direction from members of the cast and crew as well as could be expected. The cast overall exuded a sense of play and willingness to take risks, not only to successfully engage the audience, but to thrust themselves and the audience further into the heart of an original story. At times tone shifted towards the absurd and back towards the dramatic. Clear and deliberate choices were made regarding tempo, dance, mime and music which all served to move the piece to its horrific conclusion. Its a shame that it was a only a one off. I could easily have watched Eileen Little portray the Moon as she twisted and turned in the air, or the scenery chewing John J King hobble around the club for show after show. Happily, the work of this Company will be continuing with Icarus, based on the Greek myth, to be produced in May. This entry was posted in Drama, Musicals and Opera and tagged 2013, “A Lunar Labyrinth”, Cambridge, Club Oberon, Eileen Little, February, Greek Myth, Icarus, John J King, Liars & Believers, MA, Mary Bichner, May, Neil Gaiman, Special Guest Reviewer, Steven Bogart by Kitty Drexel. Bookmark the permalink.